Glasgow City Council are actively encouraging people to move from private cars to active travel. This would appear to be only for those days where ice is not forecast. On those days it would appear that the priority is to get the cars moving around Glasgow. Many of our members tweeted the dire conditions they faced while trying to undertake their daily commute. Leaving the bike and walking wasn’t really an option either. Those on foot were not fairing much better. Many had to resort to walking on the gritted roads as the foot ways were unsafe. Treacherous pavements everywhere this morning so people were forced to walk on the carriageway (where gritting kept cars mobile, obvs). It seems unfair to encourage people to move from their car to walking or cycling, then abandon them as soon as the ice comes to town. For those whose New Year resolution was to leave the car and walk or cycle, I am sure they are having second thoughts now. To enable people to commit to walking or cycling to work, school or the shops, this needs to be an option all year round. It was a similar situation during the cold snap in December. There were multiple crashes on key cycle routes, including the South West City Way and the NCR 7 beside the transport museum. So the predicted ice came to fruition and the expected skating rink on SWCW also raised it's ugly head, also as predicted. @GoBikeGlasgow @GlasgowCC @AnnaLangside GCC it's not good enough. This route was treacherous with ice and unrideable. Despite riding slow, I fell on the ice. Slips, trips and falls are the most common types of accident in life generally, but snow and ice increase this. For most falls on snow or ice result in minor bumps and bruises. If you are cycling usually the first thought is “how is the bike?”. However, hundreds each year are less fortunate. They are admitted to hospital after suffering more serious injuries after falls during wintry weather.The cost of these admissions is considerable. Falls that result in a hospital admission cost an average of £5,000 each time. For older people this rises to £8,600. While a hip fracture costs the whole care system almost £40,000. There needs to be a balancing of the cost of public health measures like gritting, with the healthcare costs associated with falls. The economic burden of falls on ice is substantial. Keeping footpaths and cycle lanes free from ice should be a public health priority. Glasgow’s busiest cycle route at 8.50am on Wednesday 30th January. Glasgow has always had a low car ownership level. Within those areas of Glasgow with traditionally lower incomes the number of people with access to a private car drops even further. For them walking and cycling is not active travel, but is how they get around. Transport Poverty is a real factor to a number of people who have limited options. They don’t get duvet or snow days. They need to get to their work or they will not get paid. However, if trying to get to their work results in a fall and injury they often don’t get sick pay either. Areas like Parkhead and Dalmarnock have 50% of children living in poverty. Access to work is a key factor in getting people out of poverty. Removing the ability for them to get to work safely is morally reprehensible. Alastair Dalton’s piece from last year is still relevant today. He highlighted how pedestrians and cyclists are hit hardest when it snows. There is never going to be enough money to clear every road and pavement, but there seems to be a clear inequity in how they are tackled. 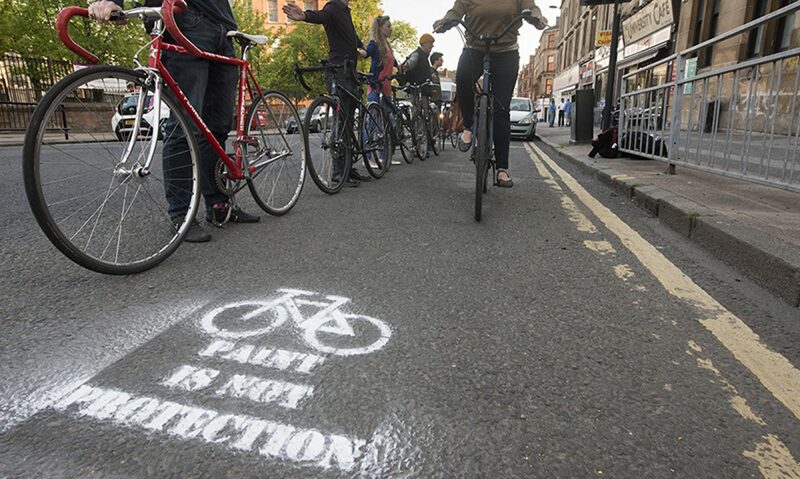 Glasgow City Council, as a matter of urgency can not neglect their moral responsibility to reduce Transport Poverty and provide safe routes for people to walk and cycle. We echo Chris Boardman’s request, that basic maintenance is provided on our foot paths and cycle lanes. We call for action from Glasgow City Council for a drastic reprioritisation of the winter maintenance policy that more fairly reflects the right for all people to get around, not just those who have access to a car. Next PostNext Consultation Digest Issue 27, 05 February 2019: University Avenue and Bears Way under threat, no cycle lanes for Union Street, Glasgow, but a wee bit of good news as well.